Can be installed as a counter top on a cabinet. Premium white glaze for a glossy finish with a kiln dried ceramic construction. Sleek single lever handle for ease of operation and temperature control. Double fired and glazed for durability and stain resistance. Ceramic top features an overflow. Faucet is constructed with lead-free brass ensuring durability. Faucet features a high-quality ceramic cartridge.Only faucet is CUPC approved. Installation instructions and hardware included in the box. All hot-cold waterlines are included. The Omni series boasts this compact, luxurious ceramic top with an integrated bowl. It features premium kiln-dried ceramic construction, and, as with all of our ceramic tops, is double-fired to maximize durability and longevity. It measures 21 in. across, 18 in. from back to front, 7 in. from top to bottom, and comes predrilled to accommodate your 4 in., off-center faucet. Coated in a fresh, stain-resistant white glaze. A simple, versatile ceramic top with premium kiln dried ceramic construction. Double-fired to maximize longevity and durability, and comes predrilled to accommodate 4 in. spaced faucets. It measures 21 in. across, 18 in. from back to front, and 7 in. from top to bottom. Coated in a stain-resistant glossy white finish. It features a rectangle shape. This ceramic top set is designed to be installed as a drop in ceramic top set. It is constructed with ceramic. This ceramic top set comes with a enamel glaze finish in White colour. It is designed for a single hole faucet. 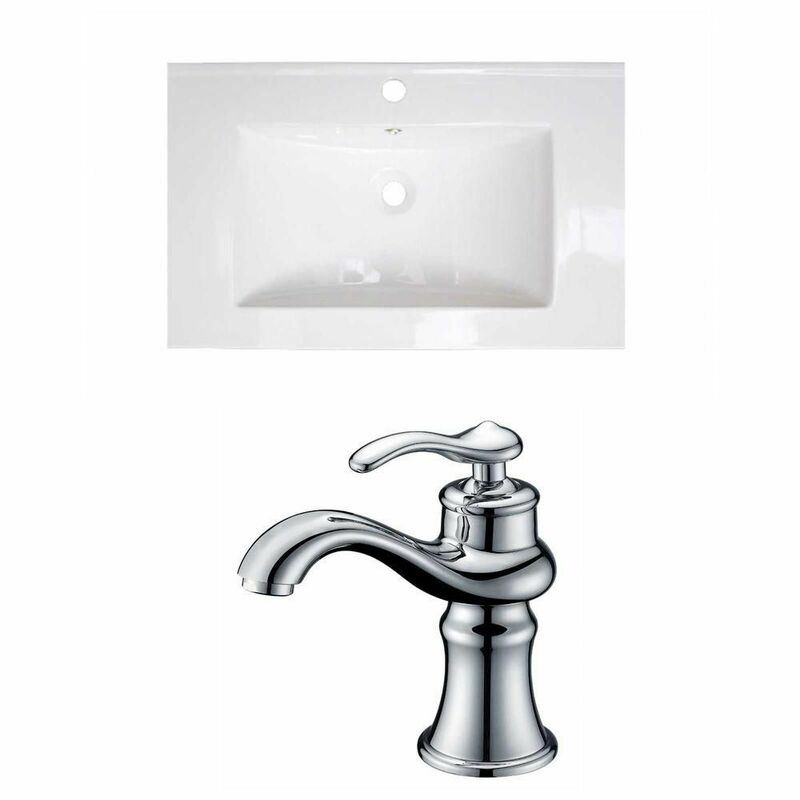 24-inch W x 18-inch D Ceramic Top Set with Single Hole Faucet in White This transitional ceramic top set belongs to the exquisite Roxy design series. It features a rectangle shape. This ceramic top set is designed to be installed as a drop in ceramic top set. It is constructed with ceramic. This ceramic top set comes with a enamel glaze finish in White color. It is designed for a single hole faucet.